Common structures = common ancestry? In most arguments for evolution, the debater assumes that common physical features, such as five fingers on apes and humans, point to a common ancestor in the distant past. Darwin mocked the idea (proposed by Richard Owen on the PBS dramatization of his encounter with Darwin) that common structures (homologies) were due to a common creator rather than a common ancestor. But the common Designer explanation makes much more sense of the findings of modern geneticists, who have discovered just how different the genetic blueprint can be behind many apparent similarities in the anatomical structures that Darwin saw. Genes are inherited, not structures per se. So one would expect the similarities, if they were the result of evolutionary common ancestry, to be produced by a common genetic program (this may or may not be the case for common design). But in many cases, this is clearly not so. 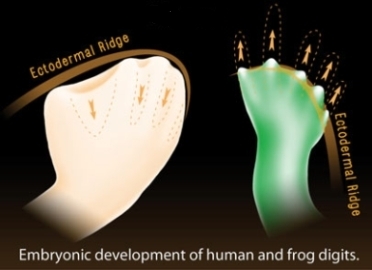 Consider the example of the five digits of both frogs and humans—the human embryo develops a ridge at the limb tip, then material between the digits dissolves; in frogs, the digits grow outward from buds (see diagram below). This argues strongly against the ‘common ancestry’ evolutionary explanation for the similarity. 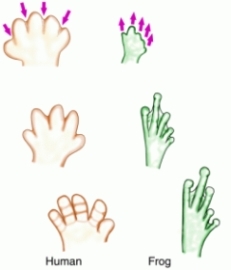 Stylized diagram showing the difference in developmental patterns of frog and human digits. 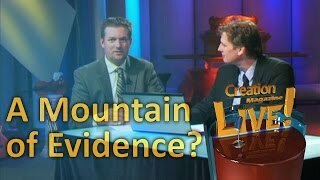 But assuming the truth of Darwinism as ‘evidence’ for their explanation is begging the question. There is no experimental evidence, since we lack the DNA code of these alleged ancestors. There is also the theoretical problem that if we change the code, then the wrong proteins would be made, and the organism would die—so once a code is settled on, we’re stuck with it. The Discovery Institute also demonstrated the illogic of Scott’s claim.4 Certainly most of the code is universal, but this is best explained by common design. Of all the millions of genetic codes possible, ours, or something almost like it, is optimal for protecting against errors.5 But the exceptions thwart evolutionary explanations. 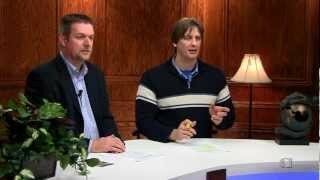 DNA comparisons are just a subset of the homology argument, which makes just as much sense in a biblical framework. A common Designer is another interpretation that makes sense of the same data. An architect commonly uses the same building material for different buildings, and a car maker commonly uses the same parts in different cars. So we shouldn’t be surprised if a Designer for life used the same biochemistry and structures in many different creatures. Conversely, if all living organisms were totally different, this might look like there were many designers instead of one. Since DNA codes for structures and biochemical molecules, we should expect the most similar creatures to have the most similar DNA. Apes and humans are both mammals, with similar shapes, so both have similar DNA. We should expect humans to have more DNA similarities with another mammal like a pig than with a reptile like a rattlesnake. And this is so. Humans are very different from yeast but they have some biochemistry in common, so we should expect human DNA to differ more from yeast DNA than from ape DNA. So the general pattern of similarities need not be explained by common-ancestry (evolution). Furthermore, there are some puzzling anomalies for an evolutionary explanation—similarities between organisms that evolutionists don’t believe are closely related. For example, hemoglobin, the complex molecule that carries oxygen in blood and results in its red color, is found in vertebrates. But it is also found in some earthworms, starfish, crustaceans, mollusks, and even in some bacteria. An antigen receptor protein has the same unusual single chain structure in camels and nurse sharks, but this cannot be explained by a common ancestor of sharks and camels.6 And there are many other examples of similarities that cannot be due to evolution. Actually, the molecular clock has many problems for the evolutionist. Not only are there the anomalies and common Designer arguments I mentioned above, but they actually support a creation of distinct types within ordered groups, not continuous evolution, as non-creationist microbiologist Dr Michael Denton pointed out in Evolution: A Theory in Crisis. For example, when comparing the amino acid sequence of cytochrome C of a bacterium (a prokaryote) with such widely diverse eukaryotes as yeast, wheat, silkmoth, pigeon, and horse, all of these have practically the same percentage difference with the bacterium (64–69%). There is no intermediate cytochrome between prokaryotes and eukaryotes, and no hint that the ‘higher’ organism such as a horse has diverged more than the ‘lower’ organism such as the yeast. The same sort of pattern is observed when comparing cytochrome C of the invertebrate silkmoth with the vertebrates lamprey, carp, turtle, pigeon, and horse. All the vertebrates are equally divergent from the silkmoth (27–30%). Yet again, comparing globins of a lamprey (a ‘primitive’ cyclostome or jawless fish) with a carp, frog, chicken, kangaroo, and human, they are all about equidistant (73–81%). Cytochrome C’s compared between a carp and a bullfrog, turtle, chicken, rabbit, and horse yield a constant difference of 13–14%. There is no trace of any transitional series of cyclostome → fish → amphibian → reptile → mammal or bird. Another problem for evolutionists is how the molecular clock could have ticked so evenly in any given protein in so many different organisms (despite some anomalies discussed earlier which present even more problems). For this to work, there must be a constant mutation rate per unit time over most types of organism. But observations show that there is a constant mutation rate per generation, so it should be much faster for organisms with a fast generation time, such as bacteria, and much slower for elephants. In insects, generation times range from weeks in flies to many years in cicadas, and yet there is no evidence that flies are more diverged than cicadas. So evidence is against the theory that the observed patterns are due to mutations accumulating over time as life evolved. National Institutes of Health , 29 August 2002. 10 September 2001 press release, PBS Charged with ‘False Claim’ on ‘Universal Genetic Code,’ . Certain archaea and eubacteria code for 21st or 22nd amino acids, selenocysteine and pyrrolysine—see J.F. Atkins and R. Gesteland, The 22nd Amino Acid, Science 296(5572):1409–10, 24 May 2002; commentary on technical papers on p. 1459–62 and 1462–66. 20 September 2001, press release, Offscreen, ‘Evolution’ Spokesperson Tries to Tar Scientific Critics Who Are Ignored, . J. Knight, Top Translator, New Scientist 158(2130):15, 18 April 1998. Natural selection cannot explain this code optimality, since there is no way to replace the first functional code with a ‘better’ one without destroying functionality. Proceedings of the National Academy of Sciences, 95:11,804; cited in New Scientist 160(2154):23, 3 October 1998.